Known as the Land of the Himalayas, Nepal has eight of the world’s ten tallest mountain peaks within its acreage. As such, Trekking in Nepal is a famous adventure activity to do and draws in many thousands of visitors every year. With a diverse terrain that expands from the southern plains to the northern mountains, Nepal is a rich country that also boats of being multi-ethnic, multi-cultural and multi-lingual nation. With many destinations and region that offer great trekking and hiking experiences, a visit to Nepal is not complete without going through at least one trekking journey in the mountains. Regions like the Annapurna, Manaslu, Langtang and Mustang among many others are famous for trekking. One of the most famous trekking journeys to do in the country would be the Everest Base Camp Trek that takes place in the Khumbu region of the country. There are two base camps on opposite sides of Mount Everest- the South Base Camp in Nepal at an altitude of 5,364 meters and the North Base Camp in Tibet at 5,150 meters. These camps are rudimentary campsites on Mount Everest that are used by mountain climbers during their ascent and descent. South Base Camp is used when climbing via the southeast ridge, while North Base Camp is used when climbing via the northeast ridge. The Everest Base Camp Trek on the south side in Nepal is one of the most popular trekking routes in the Himalayas in the country. Trekkers usually fly from Kathmandu to Lukla to save time and energy before beginning the morning trek to the base camp. The Everest Base Camp Trek starts with a flight to Lukla from Kathmandu. Landing at the Tenzing–Hillary Airport, also known as Lukla Airport, trekkers begin the journey onwards to the nest village. The Lukla Airport is also considered one of the most thrilling and dangerous airports in the world. That is why, many also claim that the flight from Kathmandu to Lukla is a small adventure in itself. From Lukla, the Everest Base Camp journey has trails moving to Phakding along the Cheplung village where lovely glimpses of Mount Khumbila can be seen. The village of Phakding lies in the Dudh Kosi river valley just north of Lukla and south of Monjo, at an altitude of 2,610 meters. It has been one of the UNESCO World Heritage Site since 1979. The trail start at Lukla and Phakding is often the main stopping point for trekkers on their way to the Mount Everest Base Camp via the Gokyo RI route or Tengboche route. The primary function of the village is to support the tourism industry and as such consists of a number of guesthouses. The views of the Kusum Kangaru Mountain is also gorgeous from Phakding. 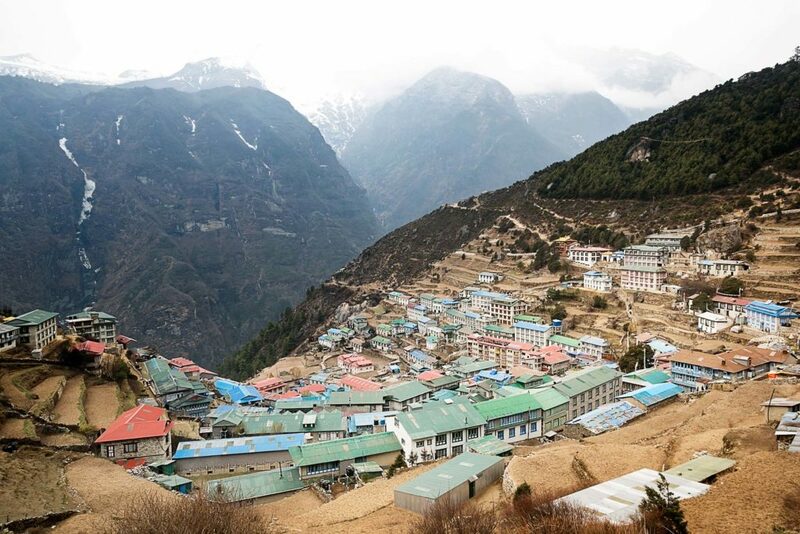 The town of Namche Bazaar is perhaps one of the most famous destination of the whole Everest Base Camp trek journey. It is located within the Khumbu area at 3,440 meters at its low point, populating the sides of a hill. Most Sherpa who are in the tourism business are specifically from the Namche area. Namche is the main trading center and hub for the Khumbu region and is also the most expensive place in Nepal, at least thrice as expensive as the capital city Kathmandu. Immediately west of Namche lies the Kongde Ri at 6,187 meters (20,299 ft) and to the east is Thamserku Peak at 6,623 meters. On a hill overlooking Namche Bazaar is the Syangboche Airport. Namche Bazaar is popular with trekkers in the Khumbu region, especially for altitude acclimatization, and is the gateway to the high Himalaya. The town has a number of lodgings and stores catering to the needs of visitors. Trekkers also need to go through the Sagarmatha National Park to reach Namche Bazaar. The famous Everest View Hotel also lies ahead of Namche and trekkers sometimes visit the hotel for a cup of tea. A village in Khumjung in the Khumbu region of northeastern Nepal, located at 3,867 meters (12,687 ft), Tengboche is another famous destination for trekkers travelling to the Everest Base Camp. Tengboche is located on a hill at the confluence of the Dudh Kosi and the Imja Khola rivers. During the winter, the snow peaks of Ama Dablam and the tip of Mount Everest seem to glows from the Nuptse ridge at Tengboche and several other peaks form a picturesque landscape from the village. Tengboche is a midway station on the trail to the base camp. The largest monastery in the region, the Tengboche Monastery also lies here and is considered as a spiritual centre of Khumbu. Further ahead from Tengboche is the Everest Base camp after passing through the village of Dingboche. A notable landmark located on the south ridge of the Pumori Mountain in the Himalayas above Gorakshep, Kalapatthar translates to “Black Rock”. Although not a proper mountain, the ascent of Kalapatthar is very popular with trekkers in the region of Mount Everest since it provides the most accessible close-up view of Everest. The views of Everest, Nuptse and Changtse are spectacular from Kalapatthar and there are glimpses of the northern flank and summit of Lhotse as well. Kalapatthar is visited by trekkers after the Everest Base Camp. The information here has been shared by Escape Himalaya Trek– a Nepal-based local travel agency that caters to arranging every travel needs in Nepal, Tibet and Bhutan. Contact NHT for organizing your next brilliant adventure!